Brushing and flossing are daily habits to keep your teeth white and healthy. However, your smile might still be lacking some sparkle or is more yellow than it used to be. Thinking about whitening? You are not alone. Tooth whitening is a process of removing blemishes and yellowing from teeth. Whitening is amongst the most effective way of lightening the natural colour of your teeth without removing any of the tooth surfaces because it can greatly improve how your teeth look. Tooth Whitening is not a one-time procedure and cannot make a complete colour change. However, when repeated from time to time you will maintain the brighter, sparkling white colour. There are a lot of reasons people might want to get their teeth whitened. People are different; and just as our hair and skin colour differ, so do our teeth. The surface stains and internal discolouration of your teeth can be caused by food and drinks such as tea, coffee, red wine and blackcurrant, Accumulation of plaque and tartar deposits, Smoking, Ingesting too much fluoride, trauma to the teeth, Treatment with the antibiotic tetracycline during childhood, and natural ageing. Before you start the process of whitening your teeth you need to consult your dentist for other dental problems. Since other dental issues can affect the success of tooth whitening. For instance, if you have cavities, it needs to be treated before the teeth are whitened. More so, if you probably have tooth decay or receding gums, whitening may make your teeth a little bit sensitive. Tooth whitening also does not work on ceramic or porcelain crowns. You can get your teeth whitened either in the dental office or at home. 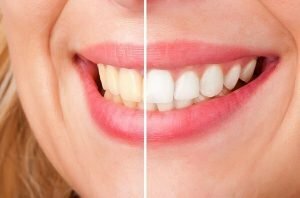 For in-office whitening, your dentist probably will photograph your teeth first then ask you questions to find out what caused the staining. Next, he will clean your teeth by removing films of bacterias, food, and other substances that build up on your teeth and contribute to the staining. Thereafter the whitening procedure starts. First, your dentist will protect your gum by putting a rubber shield or a gel on them. Thereafter, the whitening product will be applied to your teeth using a tray which fits into your mouth like a mouthguard. As the active ingredient breaks down, oxygen gets into the enamel on the teeth and its colour becomes brighter. For whitening at home, your dentist will make trays to hold the whitening gel that fit your teeth decisively. Home whitening gel typically should be used day by day for a little while. Over-the-counter kits are generally accessible for home use. They allow trays to hold the gel or whitening strips that adhere to your teeth. speak with your dentist on the off chance that you need to utilise these home products. In this era of selfies and social media, you need to look at your best. At DonEast Supreme Dental we can help you treat your teeth to the whitening they deserve. Call us today to get that sparkling, brighter and fresher smile everyone wants to see.